The one…the only…Nicky’s Vietnamese Sandwiches! I agree with the person above – Nicky’s is hands down the best, especially for a good banh mi chay. I don’t think anyone else in the city even makes one! If you’re in Brooklyn, Hanco’s is really the best. It’s on Bergen at Smith street (F or G train to Bergen) and besides the sandwiches, the vermicelli salad is also totally great, even if you forgo their super flavorful pork for the creamy, peanut crusted seared tofu! They have authentic Vietnamese coffee and quality boba drinks too. I found one of my favorite sandwiches at a little Vietnamese shop on the northern fringes of Brooklyn’s Asian community in Sunset Park. Ba Xuyên offers nearly a dozen bánh mì selections, roughly half of which contain pork in some form (e.g., shredded, barbequed, even crushed into meatballs). Additional choices include grilled chicken, turkey breast, cá tuna, and, possibly my favorite, cá mòi (sardine). Regardless of the sandwich, I always order it spicy. (Ba Xuyên’s red sauce not only adds a moderate amount of heat, but also provides a rich, savory flavor.) While most sandwiches cost $3.50, a few are higher, topping out at $4.25 for the tuna, another favorite. For $2.50, you could try one of Ba Xuyên’s unusual fruit shakes. Condensed milk, light cream, fruit, and ice are blended together to produce a refreshing drink that isn’t particularly sweet. Flavors include jackfruit, litchi, taro, papaya, and strawberry. Perhaps the most interesting, however is the durian. Owing to its profoundly rank odor, the so-called king of fruit must be sold frozen in the United States and is not permitted aboard many airlines. BX’s shake produced therefrom, however, is not nearly so malodorous and is definitely worth a try. I’d describe the flavor as a combination of egg salad and papaya. As an alternative to a shake, you could try one of the popular “pearl cold drinks,” better known as bubble tea. As with their shakes, BX’s bubble teas are not sweet. Their creaminess provides a nice counterbalance to the spice of the sandwiches, and the absence of sugar ensures that no cloying aftertaste comes between one’s palate and the enjoyment of the bánh mì. Please bear in mind that BX closes at 6:30 P.M. Although dining is limited to four tables, I’ve always found a seat. On a pleasant day, however, you may opt to enhance your dining pleasure al fresco and enjoy spectacular views afforded by the park for which the neighborhood is named. The entrance to Sunset Park is on Seventh Avenue, one block west. If you’re around Sunset Park, it’s a good find. Arguably, not as good as Hanco’s, but certainly a contender. Silent H in Williamsburg serves delicious Banh Mi at lunch in a great setting. A welcome addition to Brooklyn! Newly opened An Choi on Orchard/Grand was a nice surprise. They have had a soft opening and still in their less than a month stage. I went for lunch to try their Grilled Pork Banh Mi served with fried Shrimp Chips $5.50, Vietnamese Iced coffee and a starter of fried rolls. The pork is grilled to perfection, marinated with all the traditional Asian flavors, excellent bread and an authentic Banh Mi. My friend tried the special, it was ok. I like this spot because its run by foodies and is a place you can actually sit to enjoy. Try it! I’ve also been to Saigon Bakery and Paris Bakery for a Banh Mi as well, next stop Nicky’s and Baogette! New as of August ’09 – little tiny shop on Bedford b/w 7th and 8th in Williamsburg called, appropriately, Banh Mi. They offer 6 or so different kinds for $5. Lemongrass Chicken was delicious – nice crusty roll. Seriously cheap for this area and quite delicious! Great Place in the West Village in Manhattan called Baoguette-Phosure. Great banh-mi and pho. there are two other locations in the East Village and and Murray Hill. 120 Christopher St. @ Christopher/Bedford St.
I’m a fan of Baoguette myself but my question is: is there anywhere up town? Seconding Bagouette Cafe- I just came back from my first Banh mi ever and here I am looking them up on the internet!! 37 St marks. Yum! I have searched high and low for an uptown manhattan Bahn MI. there is nothing! I’m hungry and tired of trekking downtown every time i need a fix!! please someone open a shop or point me in the right direction. Tried about 10 places NYC ; most were good . One I’ll try again since they had just opened. Best : Co Ba 110 9th Ave Manhattan had vegaterian Banh Mi $ 8.50 table service restaurant. Cheapest : Pho Bac 82-78 Bdway Elmhurst NY had Chicken $ 3.50 plus free parking ! Lotus in Park Slope, Brooklyn is the absolute best Banh Mi I’ve had! Great Lychee Jelly and Iced Coffee as well. This place is what I miss most about living in Brooklyn. I order from Boi Noodles or Mooncake now as I live in Hell’s Kitchen but they just do not compare to Lotus! Omg this new place called Celebritea Cafe in Downtown Brooklyn/Fort Greene (near Junior’s Cheesecake, LIU, and Brooklyn Tech) has an AMAZINGGGGGGGGGGGGG banh mi =P***. My friend and I stumble upon this place walking out of her building (80 Dekalb Ave., which is the location of the store) to go to Fort Greene Park. We stop in to get some coffee and noticed on the menu there was banh mi. We had to try it and don’t regret it at all. The meat is so tender and juicy because its made into a pattie form. It was very balanced and very enjoyable. I can’t wait to visit my friend again! Lans on E. 6thst is the best!!!!!! Sao Mai. New. East Village..banh mi chay! TDF!! I had banh bi dac biet the other day from Saigon Shack on MacDougal in the village and it’s been the best that I’ve had in NYC, even in the US. 🙂 decent pho too! RUN to V-NAM CAFE on 1st Avenue between 1st and 2nd Streets (I believe it’s 20 First Ave, Manhattan), say hey to Chef Juan and order the beef sandwich. OH. MY. GOOD. GOD! Tell him “Times Square” sent you. The bistro in Sea Cliff right on the north shore of long island near Glen Cove. I get one almost everyday before work. Leaves just the right amount of heat in your mouth after each bite. And the bread has the perfect crispness. Elmhurst Queens: Joju. 8325 Broadway. Wonderful, amazing, perfect. I can’t get enough. http://www.jojuny.com/ and http://www.yelp.com/biz/joju-elmhurst. Tuesday and Thursday are Bahn Mi Special Days!! Banhmigos on Lincoln Place between 7th and 8th Avenue in Park Slope. It’s cheaper than Hanco’s, which is one of the pricier banh mi joints in the area, and they offer many other options, like pho, vermicelli salad, spring rolls, and about 15 flavors of bubble tea. I’m a big, big fan of the Tofu sandwich served spicy. The bite of jalapeno, the way the homemade mayo and hotsauce mix together to become a creamy, spicy mess, the slight sweetness of the tofu mirrored in the salty-sweet tang of the pickled vegetables, it all comes together on that whole-wheat baguette and just makes sweet music to my tongue. Hi I have a question hopefully somebody can answer for me. 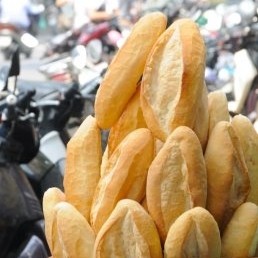 I know banh mi in shops NY don’t make their own breads, so my question is, does anyone know who supplies these breads to the various banh mi shops? Thanks any help would be greatly appreciated! Log in | 79 queries. 0.277 seconds.